This story originally appeared in ATOD. 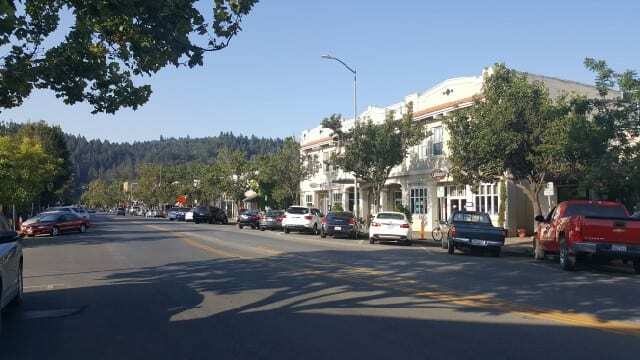 Calistoga is a diamond in the rough, a charming little rustic town located in the northern part of the Napa Valley. Famous for mineral waters, mud baths and wine, Calistoga is a place where serenity dwells. An easy flight from Los Angeles to Santa Rosa and a short thirty-minute drive later and I was in the town where Lincoln Avenue, the main street of Calistoga, is lined with wine tasting rooms, restaurants and art galleries that on a casual stroll takes about fifteen minutes to walk from end to end. Here to attend the 4th Annual Calistoga Harvest Table Dinner scheduled for the second weekend in September. 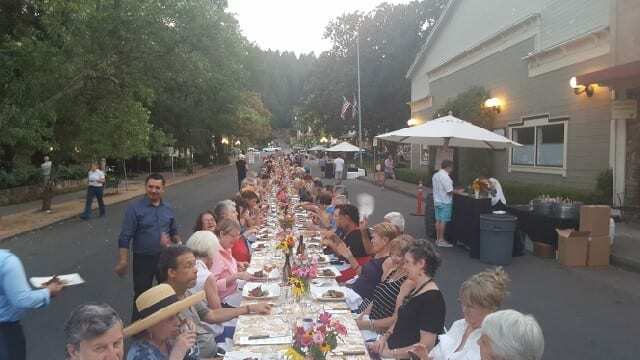 Once a year, the main street in Calistoga is shut down to cars and a 1000-foot long table is set up down the center of the road for the Calistoga Harvest Table Dinner. Thirteen local restaurants participate, each decorating their tables with their own unique style, and more than 40 wineries offer their wines by the glass or by the bottle to enjoy with dinner. I had the pleasure of dining at Calistoga Inn’s section at the table, a charming turn-of-the-century European-style hotel that is home to a restaurant and a brewery. The Calistoga Inn created a special four-course menu that included seared day boat scallops served over creamy orzo with matzutake mushroom and summer corn, a caprese salad with fresh, local heirloom tomatoes, Sonoma lamb rib chops with roasted eggplant caponata and a refreshing passionfruit panna cotta with local figs-honey compote for dessert. Sitting at the communal tables, we enjoyed chatting with the people around us and sharing different bottles of wine throughout the evening. NOTE: When Lincoln Avenue is not filled with diners, you can eat, drink, chill and sleep during a romantic getaway or a girlfriends’ weekend. With more than 35 farms within a 30-mile radius, Calistoga has access to fresh, seasonal ingredients and can offer farm to table cuisine. I happened upon this restaurant, located on the western end of Lincoln Avenue, while strolling down the street. I noticed the charming little house with an outdoor patio covered in greenery. 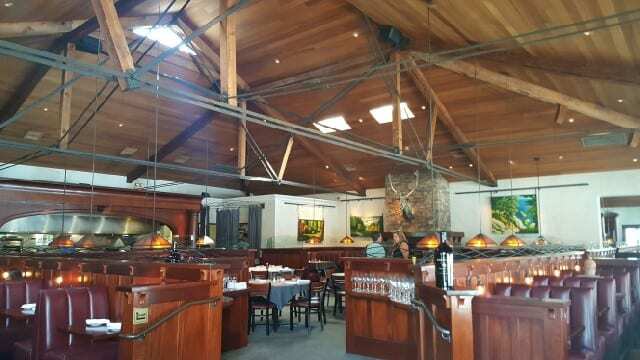 Calistoga Kitchen was recently purchased by a group of new owners. Jennifer Bennett is the managing member and known for her San Francisco restaurant Zazie where she was awarded the San Francisco Woman Entrepreneur of the Year in 2010 for leading the San Francisco movement for hourly employee rights. Calistoga resident since 2008, Jen is working with co-chef Shaun McGrath, co-chef and pastry chef Jenna Hodges and general manager and beverage director, Kaitlin Jones. 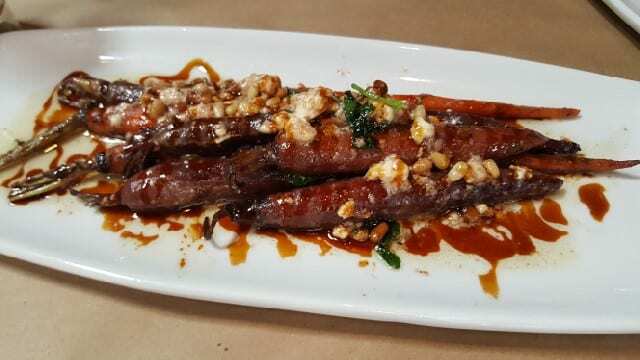 Together they have created a family-style restaurant that offers creative and flavorful dishes with seasonal ingredients. Luckily, I was with a few friends who like to share so we were able to order a handful of dishes. From the baked house made “everything ricotta”, the crispy potato cakes with house gravlax, the red plum and cucumber salad with toasted cumin and sumac yogurt, to the Forni Brown heirloom tomato salad with housemade mozzarella, I couldn’t pick a favorite dish. 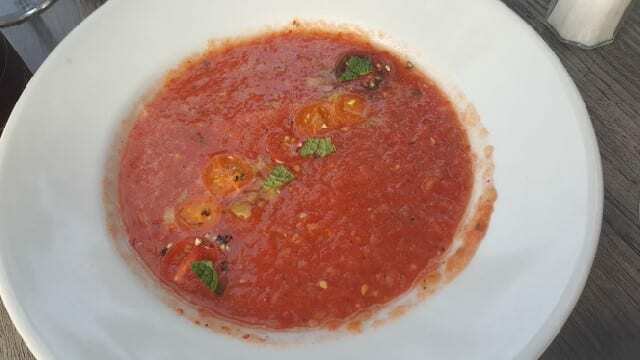 I will say that the Forni Brown tomato gazpacho, made with ripe, fresh, flavorful tomatoes, was one of the best gazpachos I have ever had. Located in the center of Calistoga, Brannans is located in a historic building that was once a motor garage. The high ceilings, sun-lights and windows that line Lincoln Avenue offer a lot of bright light to this restaurant that also features an eye-catching long bar that is an original Brunswick bar dating back to 1897. Chef Colin Curtis, who joined the restaurant three months ago, has a passion for small plates as he likes the idea of trying lots of flavors, enjoying each bite and not having leftover food in the end. 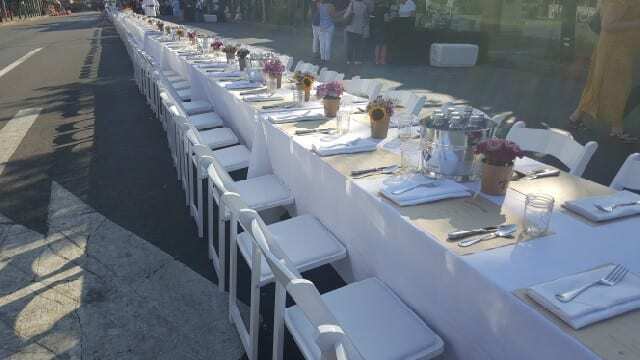 Standout dishes are the savory carrots with feta cheese, brown butter (the magic words), mint, pomegranate molasses and pine nuts, the smashed avocado bruschetta with Iberico cheese and preserved lemon and the scallop “doughboys” with broken sherry butter and pea shoots. Calistoga is home to 50 wineries, including Chateau Montelena Winery, the winery famous for winning in the historic “Judgement of Paris” competition in 1976. 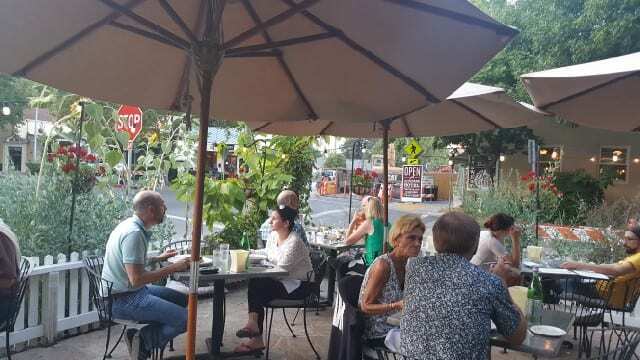 The town of Calistoga, more than a dozen wineries have tasting rooms on Lincoln Avenue. 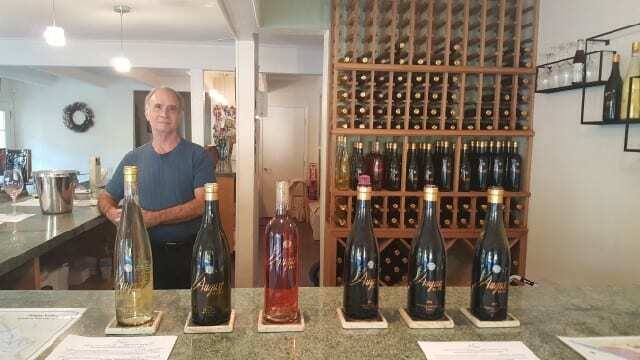 It was so hot outside, my friend and I decided to duck in to a few tasting rooms to escape the heat and we came across a lovely little boutique winery called August Briggs. Named after the original founder, August Briggs is an urban winery. They do not have their own winemaking facility or vineyards but buy grapes from top vineyards in the area. They focus on making small lots, each between 72 and 262 cases, of a variety of wines. 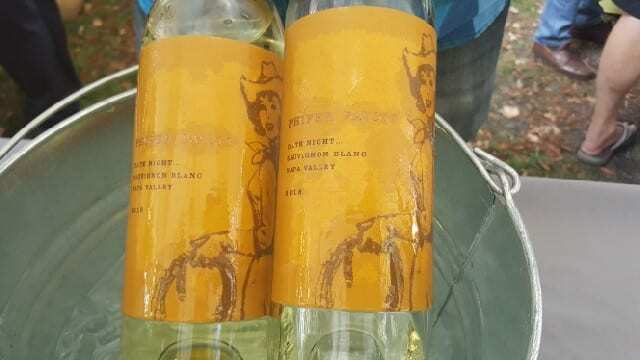 The 2016 Russian River Valley Dutton Ranch Shop Block Pinot Blanc, with aromas of nectarine, jasmine and citrus, was bright and crisp and perfect to cool us down. I was enjoying all of the wines but two standouts were the 2014 Russian River Pinot Meunier and the 2014 Calistoga Charbono. Pinot Meunier is one of the three grapes that makes up Champagne but it is rare to find outside of Champagne, France and even rarer to taste as a single variety still wine. This wine is similar to Pinot Noir with notes of cranberry, raspberry and cherry. Charbono, known in Argentina as Bonanda, is also a lesser-known red grape that has a medium body with aromas of red and black berries and high acidity. A few miles south of town is Sterling Vineyards. Their tasting room is at the top of a hill and they way to get there is quite unique. 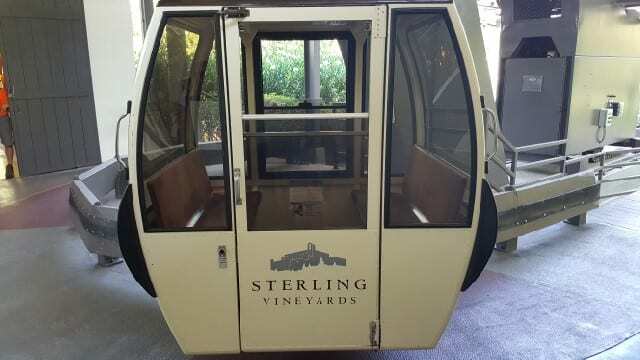 Instead of driving or taking a shuttle or even hiking, Sterling Vineyard offers an areal tram. Just like the gondolas you ride in a ski resort, you hop in and travel for under four minutes to the top of the hill, while enjoying breathtaking views. At the top, there is a self-guided walking tour, offering 365-degree views. 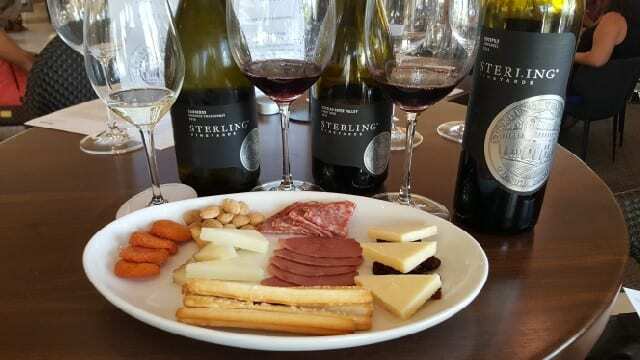 The staff at Sterling Vineyards is exceptionally friendly and quite knowledgeable about wine and made my wine and cheese pairing all the more enjoyable. There a lot to explore in Calistoga and I found a few boutique wineries that don’t have tasting rooms but, if you call ahead, make appointments for a private tasting. 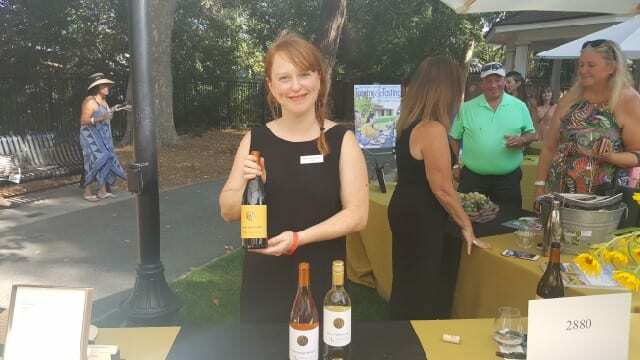 2880 Wines – Making less than 1000 cases, 2880 Wines is a family winery that focuses on Rhone varietals – grenache, petite sirah and syrah, as well as sauvignon blanc from the ½ acre of grapes that they have planted in their backyard. Phifer Pavit – Suzanne Phifer and Shane Pavitt fell in love and decided to leave the city for the country. With weekly “date nights”, they tell the story that every important decision they ever made was made on a “date night”. So, it is no surprise that their two wines, a sauvignon blanc and a cabernet sauvignon, are both called Date Night. 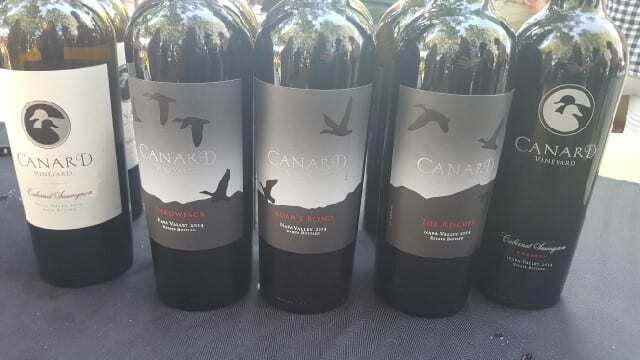 Canard Vineyard – For more than thirty years, Canard Vineyards has been producing eight wines from their estate vineyard. 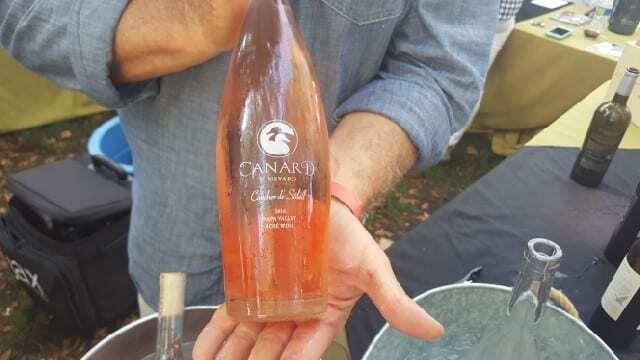 They are focused on red wines, specifically Cabernet Sauvignon and Zinfandel, but the rose, made from Merlot, Cabernet Franc and Zinfandel, and with notes of wild strawberries and peaches definitely stands out! Calistoga is known for its mineral waters and mud baths. The mineral waters come from the geothermal aquifer that runs underneath Calistoga. Coming from the earth the water is 150 degrees and is then cooled down for use. All of the pools at every hotel in Calistoga is filled with this warm mineral water which has healing properties and soothing benefits (and a hint of the odor of sulfur). 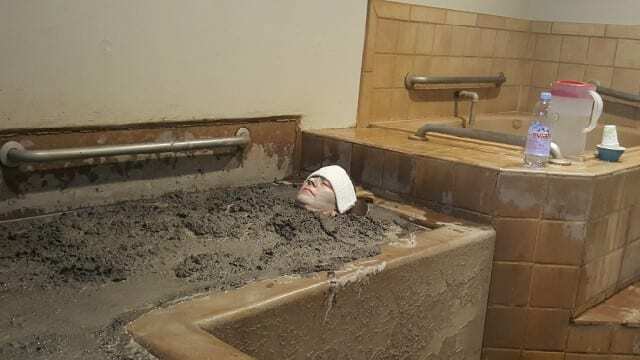 Mud baths can also be found throughout Calistoga but one of the most famous spas is the Golden Haven Hot Springs. The mud bath in Calistoga dates back to more than one hundred years. The hot mud detoxifies while relaxing the muscles and cleaning the skin. 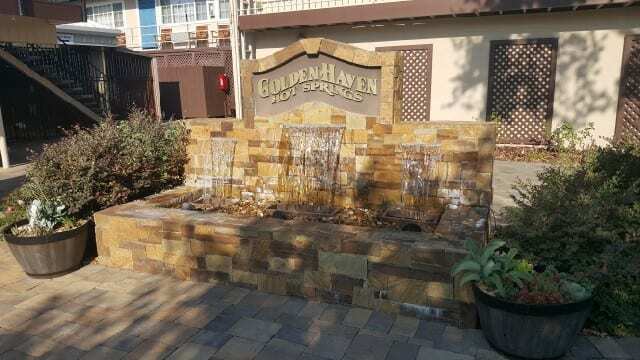 I went to relax at Golden Haven by myself but each private room is set up for couples. As I lay in the dense warm mud for ten minutes, I could feel the tight muscles in my back releasing. The attendant put a clay facial mask on me, as well as a cool towel and I closed my eyes and let go of all tension. After the mud bath, I rinsed off and soaked in a hot mineral bath, followed by a blanket wrap room to cool down. The process takes an hour but I added on a 25-minute massage as I did not want the pampering to end. Calistoga is a rustic town with many renovated but basic motels. The place to stay is Indian Springs where luxury and indulgence meet. The property was first built in the 1860s and was acquired and rebuilt by the current owners in 1988. The property houses a variety of historic cottages, bungalows and Mission Revival buildings. I stayed in one of the View guest rooms, which were built in 2014. 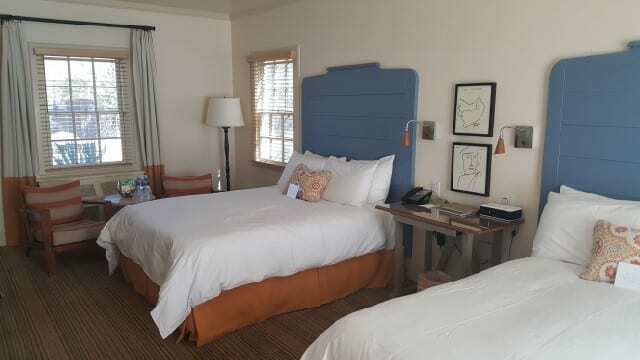 The room is modern but casual, comfortable and spacious with a patio door that opens to the Geyser lake and a walkway that connects the entire property. Indian Springs has a full spa, with mud baths, and a restaurant but the other highlight is the swimming pool. An Olympic-sized mineral pool built in 1913, it is one of the biggest pools in California. Always between 82-102 degrees Fahrenheit, I ended my day of exploring Calistoga with a late-night swim. Whether you want to eat, drink, chill or sleep, or do all of this, Calistoga is a serene escape. Read the original story in ATOD. This entry was posted in Food, Lifestyle, Travel, Wine and tagged 2880 Wines, ATOD, August Briggs, Brannans, Calistoga, Calistoga Harvest Table, Calistoga Inn, Calistoga Kitchen, Canard Vineyard, Golden Haven, Indian Springs, mineral water, mud baths, Napa Valley, Phifer Pavitt, Sterling Vineyards, Wine, wine country, wine travel by Allison Levine.